The Runic Base is a Limited Edition base and can no longer be acquired by Hunters. Forged by "The Forgotten", this ancient tablet was once used as a crafting station to enchant Runes. 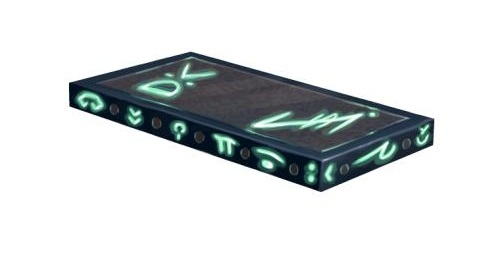 While in Bristle Woods, the engravings etched on this base begin to glow and dance along the tablet, calling out for what was once born from its surface, attracting mice carrying an abundance of Runes. The Runic Base was available for purchase for 580,785 gold from Ronza's Traveling Shoppe during Ronza's January 2011 visit. It refunded for 116,000 gold at the same location. It can no longer be obtained. Increases the chance of Runes being dropped as loot, as well as adding a small chance of receiving an extra Rune. 12 January 2011: The Runic Base was released. The Runic Base "glows" while a hunter is in the Forbidden Grove or Acolyte Realm, as can be seen here, showing its rune-boosting ability is active.